The hooks seem to grab everyone’s attention (pun intended). 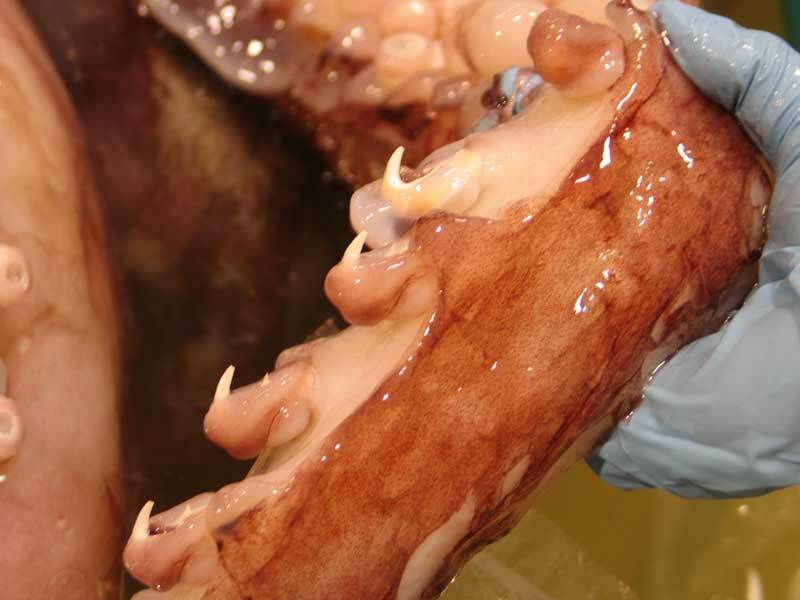 Other squid families have hooks on the arms, or the tentacles, or both, but the colossal squid is the only hooked squid in its family (the Cranchiidae, about 20 species). It possesses hooks on each of the eight arms, and also on the two long tentacles, but the arm-hooks and tentacle-hooks are very different. The arm hooks (below) do not swivel. They are set in a double row in the middle of each arm, preceded and followed by the more standard toothed suckers. The arm hooks are set in fleshy, very muscular sheaths and are strongly attached to the arms. They are likely to assist in holding and immobilising struggling prey as it is being killed and eaten. Most of the arm hooks have the main strong ‘claw’ (visible below), and also two smaller auxiliary cusps closer to the hook’s base, making them three-pointed and maximising their ability to hold and dig in. The base of each hook also has a complex structure that is set deep into the surrounding musculature. it been extinct in February 22 2007 at Antartica. You’re right Susan – we still know so little about the sea. And it is incredible how often new creatures are discovered. Even large creatures like the Colossal Squid! This wonderful squid AGAIN shows us how little we really know about the ocean and what dwells there! What about the 95% still unexplored – what shall we find there? I can’t wait! Thanks, Kat. Dim distant memories of cranchiid characters are starting to come back to me. This is amazing stuff, I’m glued to this when I should be getting on with other things! I’ll put it all up on our home projector later when the examination gets under way, and sit back with a glass of wine! I believe the systematic postition of Mesonychoteuthis is fairly stable – it has the hallmark character of the Cranchiidae, which is the head being fused to the mantle at three points (one dorsal and two ventral), where most other squids have a locking apparatus made of mantle and funnel/nuchal components that ‘snap’ together but aren’t fused. As far as I am aware Mesonychoteuthis also possesses the fluid-filled modified coelom (see this page on the Tree of Life) characteristic of the family. The Onychoteuthidae (my specialty 🙂 ) have the above-mentioned locking apparatus system between the mantle and head (not fused), no fluid-filled coelom, and possess hooks solely on the tentacles. Genetic studies regarding relationships between squid families have come up with different results, and tissue for cranchiids is scarce. 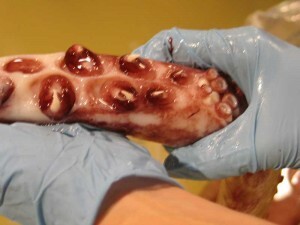 We have taken tissue from the smaller colossal squid for analysis. Alex (age 7) from Adelaide says I wouldn’t want to be swimming along in the sea and be grabbed by those hooks. Actually what does the giant squid eat? WOW, what an incredible creature. I may well mention this in class tomorrow.